October 19, 2017, from 9:00 a.m. to 5:00 p.m. come and enjoy viewing The History of Theater at Chowan, Poster Exhibition in Green Hall featuring theater production posters through the years. Steven Harders is Professor of Speech and Drama at Chowan. He began teaching at Chowan in 2003. While at Chowan he has directed productions of Night Sky, Hamlet 2, Charlotte’s Web, POE: Plays & Poems, The Murder Room, The Land of the Dragon, Twelve Angry Jurors, Wiley & the Hairy Man, among others. He is also a board member of The Gallery Theatre in Ahoskie. Prior to teaching at Chowan, he was the Artistic Director of the Generic Theater in Norfolk, Virginia. Napoleon once said, “Imagination rules the world.” Einstein concurred when he said, “Imagination is more important than knowledge.” Nowhere is the imagination more actively engaged than in the theatre. Certainly, igniting the imagination and fanning the flames of knowledge have been educational goals at Chowan since its beginning in 1848. Formal drama was not a part of the education in those early days, yet there is evidence that students recited poems, Bible readings, and snippets of English literature as part of the early commencement exercises. In 1910, Chowan Baptist Female Institute became Chowan College. Back then, The Fine Arts program was divided into four parts: Music, Voice, Art, and Expression. Students could study Drama through the School of Expression, headed by Miss Lois Vann. Expression included physical and voice work, dramatic art, extemporaneous speaking, the study of Shakespeare’s plays, as well as English and Bible readings. By 1915, there were many active clubs on campus. According to Edgar McKnight and Oscar Creech’s History of Chowan College, one of the earliest and most active clubs on campus was The Carpe Diem Club. This club organized an annual Halloween masquerade in which students dressed up and imitated members of the faculty. These students staged a mock faculty meeting in which many important questions were given deep deliberation and consideration. Later, after a faculty feast, a classroom scene was reenacted. Someone who attended the event wrote, “The entire audience was rolling with laughter at the impersonators. This was a very enjoyable evening.” So, acting and theatre were definitely alive at Chowan by 1915. By 1918, The School of Expression was headed by an appropriately named Miss Clapp and, for the first time, the college offered a course in drama. By 1923, plans for an auditorium were already being drawn. By 1926, Miss Gertrude Knott was designated as the Dramatics Director. She lived up to her name because The Chowan Dramatic Club became tied to the Carolina State Organization of Dramatics. One activity of the club was “Drama Week” in which local high schools presented one-act plays in competition for a coveted silver loving cup offered to the best one-act play. By the late 20s and early 30s, the Dramatic Club was already producing plays, scenes, and readings for public presentation. The 30s and 40s represented transitional years for Chowan as it became a Junior College in 1937 and then closed its doors from 1943-47. Flashing forward to the 1960s, drama reappears on the scene. In 1963, the award- winning novelist and folklorist Bernice Kelly Harris was on campus creating original plays through her creative writing classes. The Tidewater News in 1971 listed Ms. Harris among important Southern writers such as the North Carolina playwright Paul Green, author of The Lost Colony and Unto These Hills, and poet/historian Richard Walser. In 1964, under the tutelage of Ms. Harris, one of the plays written by Chowan College student Nancie Allen, entitled The Fiend, won the Playmaker Award at the 41st Annual State Drama Festival held at the University of North Carolina at Chapel Hill. Back on campus, the college offered an afternoon theatrical laboratory called The Dramatics Workshop. This group produced works by Eugene O’Neill, Horton Foote, and Tennessee Williams, among others. By 1965, Delta Psi Omega, a drama fraternity, was active on campus. Mrs. Edith Larson was then in charge of the theatre program, which was called The Chowan Players, and that year they produced the musical, Annie Get Your Gun. Other productions included South Pacific (1966), The Diary of Anne Frank (1967), Charley’s Aunt (1968), Life With Father (1968), and The Lantern (1968). The 70s were also a busy time for theatre at Chowan as drama edged its way into the spotlight as a Division of the Department of Fine Arts. Delta Psi Omega continued, and its membership included a young Ralph Hewitt, who later toured the country as a professional dancer and is now Executive Director of the Gallery Theatre in Ahoskie. During this time the directors of the drama program included Steve Brannon (1972-73), Nancy “Nan” Truesdale (Robinson) (1973-75), and Duane Sidden (1976-78). 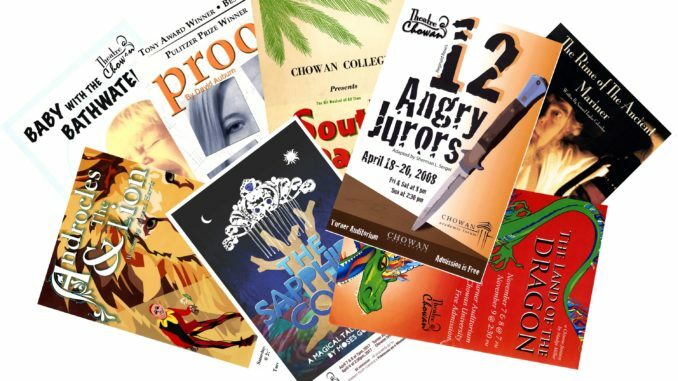 The Chowan Players produced classic and contemporary plays, such as Pure as the Driven Snow (1971), JB (1973), Waiting for Lefty (1973), You’re a Good Man Charlie Brown (1974), I Never Saw Another Butterfly (1974), Scratch (1974), Silent Snow (1975), Impromptu (1975), Roar of the Greasepaint, the Smell of the Crowd (1975), How Green was my Brownie (1976), and Arsenic & Old Lace (1978/79) which featured faculty members Betty Bachelor and Esther Whitaker. In 1978, Chowan hired Sandra Boyce to lead the theatre program. Under Ms. Boyce’s leadership, theatre at Chowan was ready for the next decade. By the 1980s the theatre program was under the auspices of the Department of Language and Literature, headed by Dr. Ken Wolfskill. Also in the early 80s, Chowan hired Dr. Joyce Elliott to teach voice & speech classes. Dr. Elliott had studied at Yale and acted on two popular daytime soap operas: The Search for Tomorrow and The Secret Storm. During the 80s Sandy Boyce directed an impressive array of classic plays as well as musicals with Dr. James Chamblee, Chair of the Music Department. These shows included Oklahoma (1982); Guys & Dolls (1983); The Rainmaker (1983); You Can’t Take It with You (1983), featuring Dr. Joyce Elliott; To Kill a Mockingbird (1987), which featured Dr. Hargus Taylor, former campus Chaplain and member of the Religion Department; The Devil’s Disciple (1987); and Dirty Work at the Crossroads (1988). The 90s represented another period of transition for the Chowan College. Productions, as records of shows and yearbooks become sporadic. Productions included Charlie Brown, Barefoot in the Park (1990), and Scenes from American Life (1993). Several shows comprised of short one-act plays united under a common theme were also produced during this time including A Question of Love (1994) and Growing Up/Growing Old in America (1995). During the early 90s, Sandy Boyce left the college to lead the theatre program at The College of the Albemarle. However, there was a bright spot for theatre at Chowan in the late 90s when the course catalogue offered, for the first time, a minor in Drama. 2003 marked the arrival of the theatre program’s current director, Steven Harders. One of his first steps was to develop a statement of purpose for the theatre program. He also commission Jennifer Groves, then a staff member, now a member of the Communication Arts faculty, to create a new logo for the theatre program. You can find it on all of the play posters directed by Mr. Harders. Plays produced under his tenure include Proof, Antigone, Androcles & the Lion, The Importance of Being Earnest, The Murder Room, The Land of the Dragon, Twelve Angry Jurors, Sylvia, Wiley & the Hairy Man, Baby with the Bathwater, A Piece of My Heart, All I Needed to Know I Learned in Kindergarten, The Jungalbook, and a variety of other contemporary and classic plays for adults and children. Today, as Chowan University continues to change and grow, theatre continues to be a part of its evolution. It certainly has been a part of Chowan’s history from the beginning. We invite you to attend or participate in a Theatre@Chowan production and become a part of theatrical history!